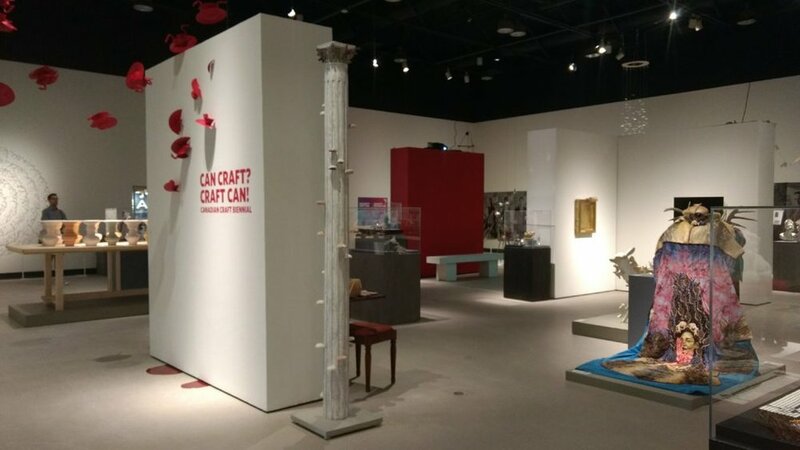 As a craft artist myself, I was extremely excited about the Canadian Craft Biennial, an event that would bring together contemporary craft artists and makers from all across the country. I often feel like there is a lack of cohesion within the Canadian crafts community, and I saw in this event a perfect opportunity to bridge all the gaps that unfortunately often separate us as artists. After visiting the national exhibition Can Craft? Craft Can! at the Art Gallery of Burlington this past week, I do believe that it will succeed in bringing people together, with a broad selection of artists from all corners of our vast country. But is it doing more than that? Gathering the works of 64 artists, the exhibition is a great survey of the diversity of practices that can be encountered within the Canadian craft community. The exhibition opens up with a striking installation by nationally acclaimed ceramic artist Christopher Reid Flock, which presents a series of flying, distorted cups and saucers. The first thing that I noticed when entering the space was unfortunately not the quality of this playful piece, but the poor lighting that was failing to give it justice, and to make anything in the gallery remotely appealing. Lighting was definitely an ongoing issue throughout the exhibition, with many dark shadows and reflections obstructing the pieces. Moreover, pieces were obstructing other pieces, with very little breathing room around each artwork. Both the lighting and the layout of the work in the gallery space were oddly reminiscent of a showroom display. There were definitely a few pieces that benefited from a rather satisfying display, such as a stunning wall-mounted glass piece by Susan Edgerley, a humorous all-brass framed “painting” by Gord Peteran, and a classic Greg Payce installation of ceramic vessels that suggest human silhouettes. But we could rarely walk around sculptural pieces, let alone look at an individual piece without being distracted by the surrounding works. I was also quite surprised to discover that the nature of materials, which I always thought was a crucial element that defines craft practices, was never included in the label information, nor was the year of creation. Craft, like fine art, is a response to a certain context in which the artists evolve. Knowing when and how a piece was created is often crucial to its understanding, and I struggled many times throughout the exhibition, not really knowing how to approach the work I had in front of me. As for jewellery work, the exhibition presented pieces by many of the most influential contemporary jewellery artists of the country, such as Pamela Ritchie, Greg Sims, Amir Sheikhvand, Despo Sophocleous, Paul McClure and Gabrielle Desmarais, among others. But most of the work was crammed in vitrines, alongside many other pieces, and was lost in the landscape of the exhibition. Having visited the exhibition with friends, who are also artists, we asked each other what our favourite works were in the exhibition. Or what stood out to us. And sadly, none of us was really able to give an answer, because we could not see anything. It was literally impossible to really appreciate a piece, to see it from all angles, to spend time with it, without being distracted by the hundreds of objects surrounding it. Perhaps the exhibition presented too many artists? Or perhaps the space was too small? Or perhaps it should even have been two exhibitions instead of one. But even considering all these variables, it seems like the exhibition design was not well enough thought out to be able to give the work the attention that it deserved. It just looked like another craft show. I surely do not want to fall into the old craft against fine art debate, which I think is often pointless, but I highly doubt that the very best of Canadian fine art would have been displayed like this. Is this debate really about craft being disregarded, or is it more about craft disregarding itself? If this is all the craft community can do to highlight its best contemporary artists, then we might need a quick reality check. Contemporary craft deserves to be seen and appreciated, and is just as valuable as any other art discipline. Will we ever give ourselves the vitrine that we need and deserve? Can Craft? I know for sure that Craft Can. But can we? National exhibition Can Craft? Craft Can! Marie Eve G. Castonguay is a contemporary jewellery artist currently based in Toronto. She is an artist in residence at Harbourfront Centre since 2014. She holds a diploma from the École de Joaillerie de Québec (2011) as well as a Bachelor of Fine Arts in Jewellery Design and Metalsmithing from NSCAD University, in Halifax (2013). Her work was showcased in various exhibitions throughout Canada as well as in various countries in Europe such as France, Romania, Spain, Austria and Greece. Marie-Eve has been a writer, member of the editorial board and section coordinator for Bazzart Magazine since 2013, she co-founded MetalAid, and is part of the artist duo MaDe Collective.